The Mitton Hoard is a hoard of silver coins found near Clitheroe in Lancashire, England, in 2006 or 2009. The hoard is now in Clitheroe Castle Museum. The documented treasure consisted of 11 silver coins or parts of coins. Mitton is divided into two villages, Great Mitton and Little Mitton. This find was first detected to the west of Great Mitton between the River Hodder and the River Ribble. The find was near a bend in the River Hodder. One source says that these coins were found in 2006 whilst another says that the coins were found using a metal detector on Monday 7 September 2009. The treasure was declared to be treasure and it was obtained by the museum services. The hoard is now on display in the Clitheroe Castle Museum. The hoard can be dated from the date of the last coin that was included in the hoard and this came from the 1420s. Three of the coins were the oldest and they dated to the reign of Edward I or Edward II. The English silver is 97.5% pure whilst the French fragments are 80% pure silver. With the exception of the farthing these coins represent all the small value coins. It is thought that these coins could all be in circulation at the same time. The hoard was probably either accidentally lost, or deliberately hidden, in the late 1420s. There are also two small fragments made for Gaucher V de Châtillon between 1313 and 1322. Gaucher V de Châtillon held one of five highest officers of state as he was the Constable of France from 1302 to 1329. Note: Eleven of the coins are documented however there are more than eleven coins on display at the Clitheroe Castle Museum. 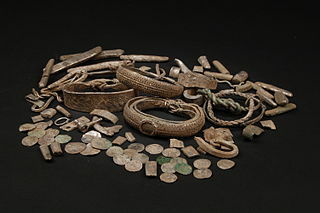 Wikimedia Commons has media related to Mitton Hoard. ^ "Mitton Hoard location". OpenStreetMap. ^ a b "Clitheroe Castle Museum". Lancashire.gov.uk. Retrieved 16 September 2009. ^ a b c d "Coin hoard BM-193206". Finds.org.uk. Retrieved 16 September 2015. ^ Ashworth, Susan (2010). Clitheroe Castle Museum. Castle Keep, Museum and Park. Lancashire County Council. p. 17. ISBN 9781857596489. The Forest of Bowland, also known as the Bowland Fells, is an area of barren gritstone fells, deep valleys and peat moorland, mostly in north-east Lancashire, England with a small part in North Yorkshire. It is a western spur of the Pennines and was once described as the "Switzerland of England". The River Ribble runs through North Yorkshire and Lancashire in Northern England. It starts close to the Ribblehead Viaduct in North Yorkshire, and is one of the few that start in the Yorkshire Dales and flow westwards towards the sea. The River Hodder is a river in Lancashire, England. The river is a County Biological Heritage Site. Guildford Museum is the main museum is in the town of Guildford, Surrey, England. The museum is on Quarry Street, a narrow road lined by pre-1900 cottages running just off the pedestrianised High Street. This main site of the museum forms the gatehouse and annex of Guildford Castle, which the staff help to run. It is run by Guildford Borough Council and has free entry between 11am - 4.45pm on Monday to Saturday. It is closed on Sundays and on Christmas Day. The Shrewsbury Hoard is a hoard of 9,315 bronze Roman coins discovered by a metal detectorist in a field near Shrewsbury, Shropshire in August 2009. The coins were found in a large pottery storage jar that was buried in about AD 335. Great Mitton is a village and a civil parish in the Ribble Valley, Lancashire, England. It is separated from the civil parish of Little Mitton by the River Ribble, both lie about three miles from the town of Clitheroe. The combined population of both civil parishes at the 2011 census was 266. In total, Great and Little Mitton cover less than 2000 acres of the Forest of Bowland, making it the smallest township in the Forest. Historically, the village is part of the West Riding of Yorkshire, but was transferred to Lancashire for administrative purposes on 1 April 1974, under the provisions of the Local Government Act 1972. The Silverdale Hoard is a collection of over 200 pieces of silver jewellery and coins discovered near Silverdale, Lancashire, England, in September 2011. The items were deposited together in and under a lead container buried about 16 inches (41 cm) underground which was found in a field by a metal detectorist. It is believed to date to around AD 900, a time of intense conflict between the Anglo-Saxons and the Danish settlers of northern England. The hoard is one of the largest Viking hoards ever discovered in the UK. It has been purchased by Lancashire Museums Service and has been displayed at Lancaster City Museum and the Museum of Lancashire in Preston. It is particularly significant for its inclusion of a coin stamped with the name of a previously unknown Viking ruler. Castle Rings is a univallate hill fort in the parish of Donhead St Mary in Wiltshire in England. The fort is a Scheduled Ancient Monument, with a list entry identification number of 1005698. Castle Rings has been dated to the Iron Age and is situated at an altitude of 228 metres (748 ft) upon Upper Greensand sandstone beds. The main bulk of the fort enclosure lies within the boundaries of Donhead St Mary parish but some of the outlying earthworks are situated in the neighbouring Sedgehill and Semley parish. In the mid-1980s a metal detectorist unearthed a hoard of stater coins of the Durotriges tribe within the hill fort. The Bedale Hoard is a hoard of forty-eight silver and gold items dating from the late 9th to early 10th century AD and includes necklaces, arm-bands, a sword pommel, hacksilver and ingots. It was discovered on 22 May 2012 in a field near Bedale, North Yorkshire by metal detectorists, and reported via the Portable Antiquities Scheme. Following a successful public funding campaign, the hoard was acquired by the Yorkshire Museum for £50,000. Clitheroe Castle Museum is located in Clitheroe, Lancashire, England, in the former Steward's House, a Grade II listed building that was built in the 18th century to house the steward of Clitheroe Castle. It is a museum showing the history of the local area.